Often we cannot put into words what we are thinking, feeling or needing. We are not able to express or connect our thoughts and feelings to others, but there is something about a movie, a book, or a song, that connects with a person in a way that provides them the motivation and inspiration that they need to push through and achieve the success that you have been holding yourself back from. They are now able to say the words, or weed through the thoughts and feelings they want to express, but are not able too. 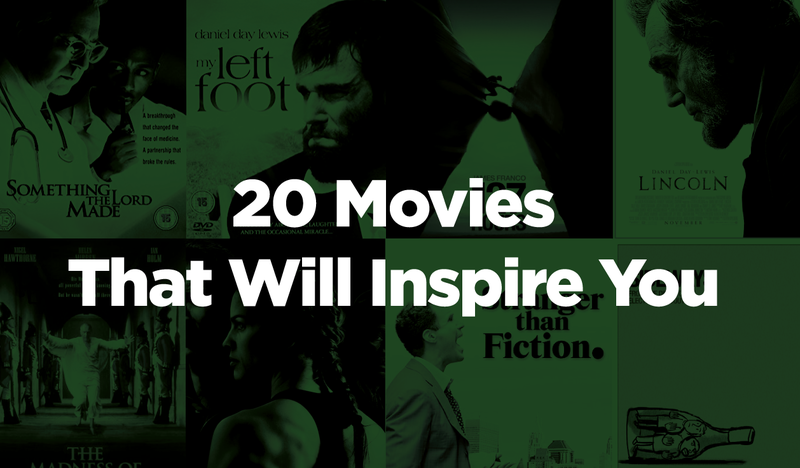 Here is a list of 20 movies that are particularly inspiring that they might want to watch the next time you need a little motivation and help being inspired to do something, or just revel at the strength and possibilities in each of us. The story of this young man’s spirit and survival while on a boat, stranded, endangered, as he crosses the ocean in a boat fighting for his life. The story of a boy and a violent tiger as his only companion. He is quoted as saying, “The whole of life becomes an act of letting go, but what always hurts the most is not taking a moment to say goodbye.” Pi. Little has to be said to explain why this movie if inspiring if you have seen it. It is the story of someone who would not be told what their limits were. Someone who would not give up on themselves, and found ways to adapt and achieve whatever they set their mind too. With just the use of one foot, one man showed you that with little more than hope and perseverance, you can achieve great things. This story shows no matter how much has gone wrong, no matter how flawed we might have been, how many choices we had made in the past that we do not want to define us, there is always hope for the future. With a little bravery, and belief in self, we never know when out happily ever after is possible. If ever there was a story of sheer will and want of survival, this is it. The extent that this man went to in order to survive, and to never give up, would be unimaginable to most. How far would we go in order to live? What do we have within us? I am willing to bet that he did not know until his will was truly tested, and neither would most of us. I think the inspiration of this film was the fact that he, his wife, and those around him would not give up on him, although it appeared as though he was losing his mind. He had been, and would end up being considered a great man and leader. What turned out to be a temporary illness that was resolved, may have been overlooked had he not had the faith and support of those around him. Talk about a trail blazer. This was the story of someone who has bravery perseverance, and was not afraid to blaze a trail. She seemed to not fear anything, even death in the end, and asked someone to help her, when she could not help herself, make the ultimate decision that some might view as giving up, but others can hopefully see as great strength. This is the story of a seemingly shy and introverted man who went against the path that was being laid out for him, literally by the narrator in his head, to live the life he wanted to live. He was an unexpected hero of his life story, and that was what made him so relatable and endearing. I found this movie to be especially inspiring, not only because you have an automatic Oscar worthy film if you but Daniel Day Lewis in it, but because it was the glimpse into the life of a man who was far ahead of his time. He was brave and unafraid to speak his mind and try and do what was right, even with many around him telling him that he was wrong. He was truly an inspiration. The story of the team of a doctor and his unlikely partner who saved countless lives with their work and development of a specialized heart bypass surgery. It showed that seemingly ordinary people are capable of incredible things if given the chance, and that knowledge that someone believes in them. This might seem like a choice that would not be obvious to all, but it really is a story of possibility, hope, and what lies within each of us. It is the story of a man who feigned mental illness to avoid punishment. He is put in with individuals who had accepted and become their illness. He showed them that they could have interests, hopes, and dreams, and they could be better than they had given themselves credit for. This movie touches you in so many ways. There are so many characters to connect with and be inspired by. From people who risked their lives and their jobs, to those who risked their relationships and reputation to share the truth and tell the real stories of those who lived a life of oppression and maltreatment. These brave women came together, no matter what the consequences, to make sure that the stories were told. This is a movie that is particularly moving. It is about a child musical genius. He lived a wild and scandalous life, but he continually produced work that holds up as the most inspirational to this day. His gifts were envied, and his talent was admired. He died too young, and would surely have kept producing masterpiece’s has he had the years to do so. He is an example of what you can accomplish in even a short time when you love what you do. This is the story of one ordinary woman who accomplished extraordinary things when given the opportunity. She had faith in herself, and what was right. She would not take “no” for an answer, and she got justice for individuals who would have been over-looked if she had not felt so passionately about their case. This film is an amazing epic based on a true story. To know that these individuals existed, to know that individuals risked their lives to save those of people they had never met, because it was the right thing to do, was inspiring. It showed the bravery and strength, and the willingness to do the right thing, simply because it was right, and not for the accolades, as the heroism would stay a secret for many years to come. I will admit it, I thought George Clooney was robbed when he did not won the Oscar for this part. I felt this was such a gripping movie and role. It was a father dealing with tremendous grief and pressure, and who showed grace and strength, and love in all areas of his life. He grew as a person, and especially as a father during this time. I don’t want to seem like I am on a big Jim Carrey love fest, as I have mentioned him twice on this list, but I feel this movie is moving. It shows the strength of love, of a bond, of the fate of two people, if they believe in it and feel it strongly enough. It gives hope that if we are meant to be with someone, or meant to follow a certain path, we will end up on it. I love this movie. This is the story of a man that actually shows exceptional will and bravery to leave all he has ever known to explore and experience what is real and what might be. He could have stayed with what was known and what was comfortable, but chose to persevere and despite all obstacles to see what was possible for him. As a psychologist, this movie really struck a chord with me. This is the story of hope, even temporary and possibilities. It shows what people can and would do if given even a window of time to do it in. What would be important to them, what would they want to accomplish, what would come first? It shows what someone’s priorities are, and what their hopes, dreams and priorities would be, even for a brief window of time.